Status: offline 24 year old male jumped from the deck of a landed blackhawk helicoptor (height of about 2.5 feet distance). He was carrying all of his military equipment (about 80 pounds) when he landed on uneven terrain. He felt his knee give out from underneath him and had immediate pain over the anterior and lateral knee. He was unable to walk after the fall and was helped to the hospital. What are the findings? (We were unable to get a true lateral exam due to pain). Status: offline Well, there is no obvious Greenspan Femoral fracture, and no obvious Hohl tibial fracture. There is no patella alta. It's hard to see because it's not a classic lateral view and due to what I think is the orientation upon A/P view, but I'd want an MD to take a look at the lateral supracondylar area. Is that a compression fracture I see? Also, on the pseudo-lateral there appears to be a small rupture of the quad tendon from the patella, with perhaps a little associated boney avulsion. Also something I'd want the MD to check up on. Acute knee trauma isn't my area at all. This should be a fun one. Status: offline I don't see much of significance here. I think I see what Drew is getting at about the superior pole of patella but don't think that it represents anything out of bounds of normal. Given the age and mechanism of injury, we are almost certainly talking soft tissue injury rather than a fracture. 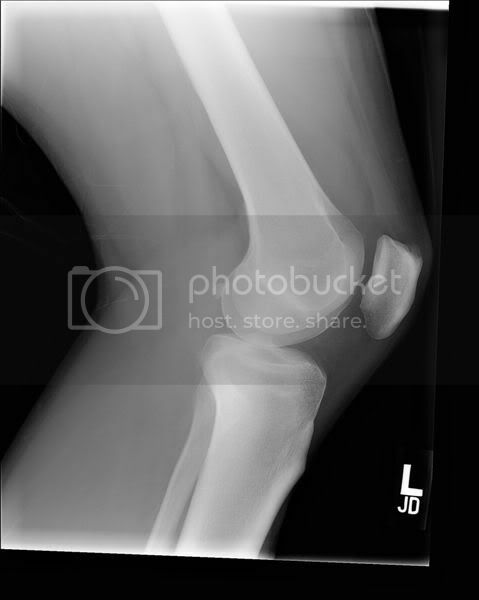 I have looked for a patellar, tibial plateau, or segund fracture, but can't see any of those. Status: offline I would say there is a quad tendon rupture. Of incidental note, he has a fabella. Status: offline Quad tendon ruptures are almost unheard of in a patient of this age, where patellar tendon ruptures are much more common. That's a good idea, Steve, I hadn't thought of that. Status: offline Can't see any fractures but since it was taken soon after the injury, I guess one would wait to see the bone healing if there was any. If there is soft tissue injury, will anything else be ordered to confirm it? Status: offline I don't see any fractures... but my eyes are always drawn to spacing. 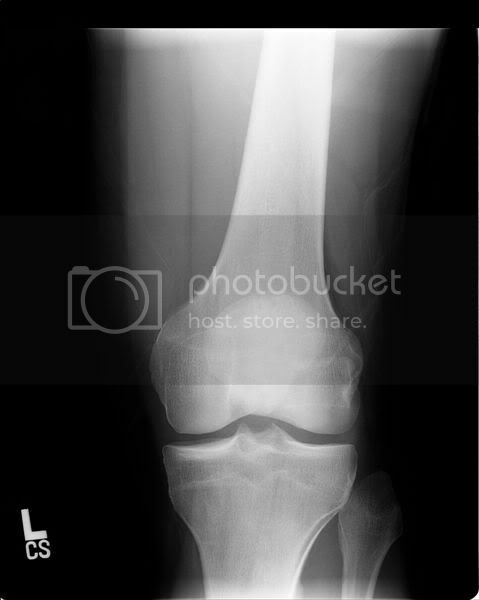 Is the amount of space between the fibula and the tibia normal? To my eyes, it just doesn't look like the fibula is fitting in nicely in the AP view. Status: offline The patella is hanging by a thread. Status: offline I'd like to see a tunnel view but I think the small calcification is a phlebolith.....nothing to worry about. I'd say there's probably a meniscal injury due to the possible forced flexion, but also a possible quad tendon rupture and/or lateral collateral insult. Status: offline To my totally untrained eye that patella looks like it is too high. Jumping from a helicopter, I guess ACL and meniscal tear. Maybe dislocated the patella and it spontaneously reduced too. Am I missing any guesses? Status: offline The patella definitely looks adrift - rupture of quad tendon? Which might explain why it looks high, although that can occur without any trauma to tendons. The fabella is the first thing I noticed. Good call. The patella looks as if it's in normal position to me. Status: offline Fabella is found in, if I remember correctly, about 10%-15% of the population. It's a normal anomoly. Status: offline "It's a normal anomoly." This oxymoron has me cracking up, and just can't let it pass. "Anomolies"(abnormalities) can be non-pathological, clinically significant, clinically insgnificant, an incidental finding, etc, but they are never "normal". If they were normal, they would not be anomolous. Fabellas are sesamoid bones. They form in the lateral head of the gastroc. They are seen very frequently(I am guessing close to 50%). Some people develop them, some don't. To my knowledge, they are clinically unimportant except in possibly a very rare circumstance. Sesamoids also commonly form in the hand and foot. As to this case, the quadriceps tendon appears to loose continuity at the suprapatellar margin. What I visualize, I would consider diagnostically inconclusive and would seriously consider ordering an MRI on this one. The two films submitted, to the extent visualized appear to be negative for fracture, dislocation, or bony pathology. Good point, how how about "this anomoly is not particularly uncommon, nor clincally significant." I do not consider sesamoid bones "anomolous". Do you? I would classify them as normal variants. Some people have them, some don't. Either is considered "normal". Status: offline Having two palmaris longi on one side or none at all is not an anomoly, either. Neither is an L6. Status: offline [QUOTE]Having two palmaris longi on one side or none at all is not an anomoly, either. Neither is an L6. I agree with Jeep. [/QUOTE]??????????? I must be missing something here Nari- Would you please elaborate? Status: offline I am sure that the fabella has nothing to do with this case and it is a fairly common "abnormality". For a guy who does not see a lot of knee x-rays it was an interesting aside.